These jeweled, enameled, and gilt-silver repoussé covers for a gospel are examples of the work produced in the late seventeenth-century silversmith workshop of Kayseri. Both front and back cover are signed, informing us that they were made in Kayseri in 1691 by Astuatsatur Shahamir. 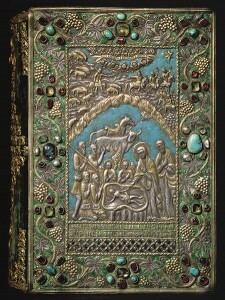 The central image on the front cover depicts the Adoration of the Shepherds, and above, the magi following the star. Amid angels, the banner in the sky proclaims, “Glory to God in the highest and on Earth peace.” The same composition of shepherds appears on two sets of gospel covers made in Kayseri by M. Karapet Malkhas, one dated 1671 (Mekhitarist Library, Vienna, MS 416) and the other dated 1691 (present location unknown). On the back is the Resurrection, showing Christ in a mandorla holding a bannered cross, surrounded by baroque cherubs and clouds. 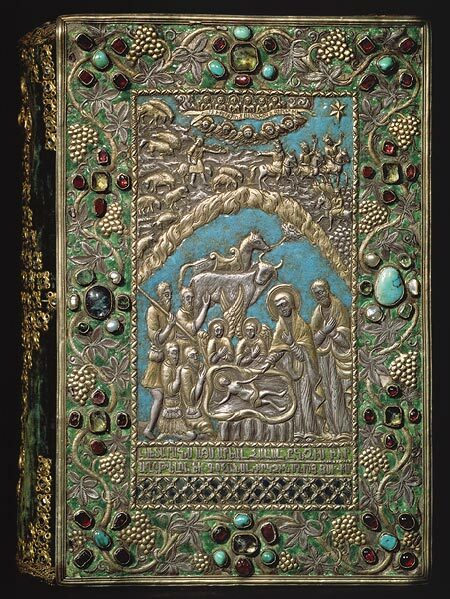 The green velvet spine is decorated with six garnets and numerous glass or crystal gems arranged in a diamond pattern. These covers were attached to a gospel copied and illuminated by a thirteenth-century scribe named Grigor, possibly from Cilicia.